I do not sell reprints or copies; all manuals are originals. Since this manual is over 50 years old, there may be some light yellowing and minor wear ect. Of the pages; however, it is in very good condition overall. 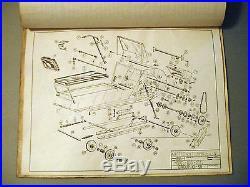 Very Rare 1963 Antique Arctic Cat Model 100 & Model 101 Parts And Instruction Manual--12 pages in length and basically lists parts with diagrams and part numbers for the Model 100 and Model 101. It also covers an introduction to Arctic Cat, general information, starting, changing the drive belt, operating instructions, track tension and general maintenance information for the 504 and 504 clutches. 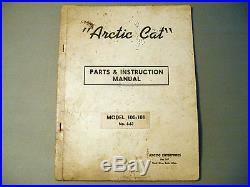 Arctic Cat part number 6-63, printed 1963. The item "1963 Antique Arctic Cat Model 100 & Model 101 Parts And Instruction Manual" is in sale since Friday, February 10, 2017. This item is in the category "Sporting Goods\Winter Sports\Snowmobiling\Manuals". The seller is "modifiedcatracer" and is located in Minneapolis, Minnesota. This item can be shipped to United States, to Canada, to United Kingdom, DK, RO, SK, BG, CZ, FI, HU, LV, LT, MT, EE, to Australia, GR, PT, CY, SI, to Japan, to China, SE, KR, ID, to Taiwan, TH, to Belgium, to France, to Hong Kong, to Ireland, to Netherlands, PL, to Spain, to Italy, to Germany, to Austria, RU, IL, to Mexico, to New Zealand, PH, SG, to Switzerland, NO, SA, UA, AE, QA, KW, BH, HR, MY, CL, CO, CR, PA, TT, GT, HN, JM.